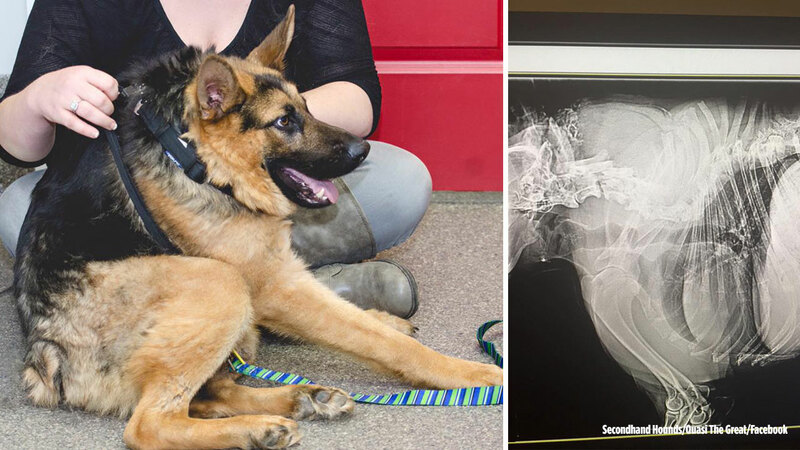 Quasimodo, a German shepherd with short spine syndrome, is becoming an internet sensation with his inspiring story. EDEN PRAIRIE, Minn. (KABC) -- A rescue dog with a rare syndrome is taking the internet by storm with his big heart and inspiring story. At first glance, it may appear Quasimodo is backing away from the world. But in fact, he's very loving and outgoing. Quasimodo has short spine syndrome, which is a severe shortening of the spine due to compression of vertebrae. The German shepherd was a stray who entered a shelter in Kentucky, but then was taken in by Secondhand Hounds in Eden Prairie, Minnesota, according to ABC News. Secondhand Hounds, a non-profit animal rescue, said Quasimodo arrived in their care on Thursday and he went to the veterinary office on Friday. Short spine syndrome is so rare, Secondhand Hounds said Quasimodo is only one of 13 dogs known to have it in the world. As Quasimodo begins his new journey, his caretakers are documenting his journey on the "Quasi The Great" Facebook page. Since its creation, Quasimodo has won over the hearts of thousands, so much in fact that Secondhand Hounds was flooded with requests to adopt him. The rescue group said the plan is to get Quasimodo completely healthy and then revisit adoption. To learn more about Secondhand Hounds and how you can help their efforts, click here.